Comments: BRAND NEW W/FAST SHIPPING! 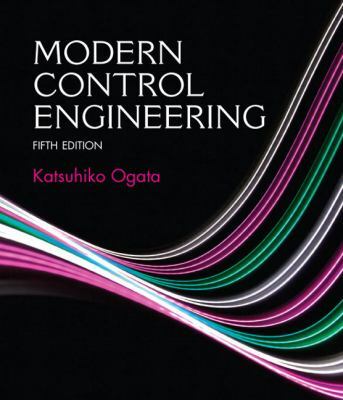 This item is: Modern Control Engineering, 5th Ed., 2010, by Ogata, Katsuhiko; FORMAT: Hardcover; ISBN: 9780136156734. Choose Expedited for fastest shipping! Our 98%+ rating proves our commitment! We cannot ship to PO Boxes/APO address. To avoid ordering the wrong item, please check your item's ISBN number! Comments: Fast Ship! Good Condition! May contain highlighting, underlining, notes, etc. Used Textbooks may NOT include supplements such as access codes or any other items. PAPERBACK edition. For senior or graduate-level students taking a first course in Control Theory (in departments of Mechanical, Electrical, Aerospace, and Chemical Engineering).A comprehensive, senior-level textbook for control engineering.Ogata's Modern Control Engineering, 5/e offers the comprehensive coverage of continuous-time control systems that all senior students must have, including frequency response approach, root-locus approach, and state-space approach to analysis and design of control systems. The text provides a gradual development of control theory, shows how to solve all computational problems with MATLAB, and avoids highly mathematical arguments. A wealth of examples and worked problems are featured throughout the text.The new edition offers many updates including coverage of ethics and an enhanced Companion Website that offers new links and new activities in research and writing.Ogata, Katsuhiko is the author of 'Modern Control Engineering', published 2009 under ISBN 9780136156734 and ISBN 0136156738. Loading marketplace prices 170 copies from $14.90 How does the rental process work?